Level 2 required. Please respond to your Order Confirmation with proof of Certification level otherwise your package may be delayed. A picture or scan of your membership card or a letter/email from Tripoli or NAR is fine as well. Disposable Motor System (DMS) with adjustable delay. No hardware required; none to lose or borrow! Requires Universal Delay Drilling Tool to trim delay (Part UDDT). Purchased in person last summer from Pyrobob while back in the Republic o' Texas visiting family, I used this powerful, single-use motor to fuel my NAR Level 2 certification flight yesterday at the Michiana Midwest Blast. 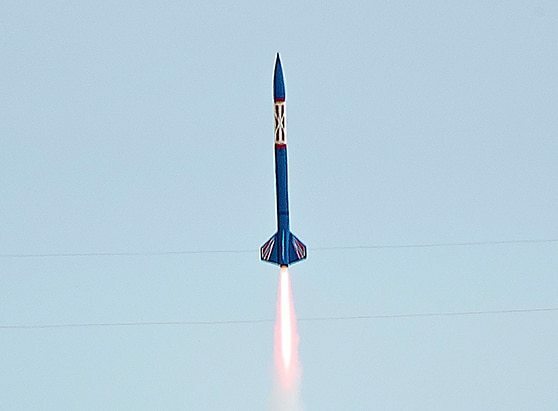 The AeroTech-assembled powerplant lofted my scratch-built, 2-1/2kg, 1.9-meter long Mach Schnell Estelle dual-deployment bird to a successful 4568-ft apogee (a personal record). Once up there still in one piece, the aptly-named Perfect Flite Stratologger CF managed to return Stella back to earth in the same condition. Now I'm usually such a miser that I almost exclusively use AT's RMS motor kits and reusable hardware. But with so many details to sweat over before the flight, it was great not to have motor assembly among them. The only motor-specific caution I used was to block the motor in the motor tube with a length of 38mm coupler tubing between the rocket's bulkhead and the motor to ensure a failed retainer ring would not jeopardize the flight, in accordance with AeroTech's advisory. (It apparently wasn't necessary, but added to my peace of mind.) Thanks Bob, for recommending the J270, and for the heads-up on adding a belt to the suspenders on this early DMS motor which reported a (very) few issues with motor retention.